LaDainian Tomlinson is heading home to San Diego to consider his options after spending a day with the New York Jets and leaving without a deal. The free-agent running back was on a flight Saturday morning after his visit. He had dinner in New Jersey on Friday night with coach Rex Ryan, general manager Mike Tannenbaum and other team officials. That meeting came a day after Tomlinson was in Minnesota to meet with members of the Vikings. Minnesota hopes to sign the eighth-leading rusher in NFL history. It was uncertain if Tomlinson would decide between the Jets and Vikings, or visit other teams. Tomlinson was scheduled to fly back home to San Diego, but changed his flight after arriving so late Thursday night. Because of that, the Jets extended their visit with him Friday to include dinner. There were also no late-night flights to the West Coast available Friday night. The running back's itinerary beyond Friday night had not yet been determined, Jets spokesman Bruce Speight said. The extra face time with Tomlinson could work in the Jets' favor as they try to persuade him to join the offense that ranked No. 1 in rushing last season. The visit came a day after Tomlinson met with the Minnesota Vikings and left for the New York area without a deal. Tomlinson, released by San Diego last month, ranks eighth on the NFL's career rushing list with 12,490 yards. If he chooses to join the Jets, Tomlinson would serve as a backup to Shonn Greene, who emerged in his rookie season and made Thomas Jones expendable. Jones signed with Kansas City earlier this week. Tomlinson will turn 31 in June and is coming off the least productive season of his career, rushing for 730 yards on 223 carries for an average of 3.3 yards per carry, all career lows. He scored 12 touchdowns, but his role was reduced in an offense that shifted its focus to Philip Rivers and the passing game. He's still regarded as an excellent route runner and superb pass catcher, two qualities that make him attractive to both New York and Minnesota. Tomlinson could be intrigued by the possibility of taking handoffs in Minnesota from Brett Favre, who's still mulling whether to return for a 20th NFL season. Meanwhile, the Jets have Mark Sanchez returning for a second season along with a solid offensive line that helped pave the way for New York to average a league-leading 172.2 yards on the ground per game. Whether he chooses the Jets or Vikings, Tomlinson would not be the focal point of the offense, as he had been for so many years with the Chargers — a role he has said he's OK with. 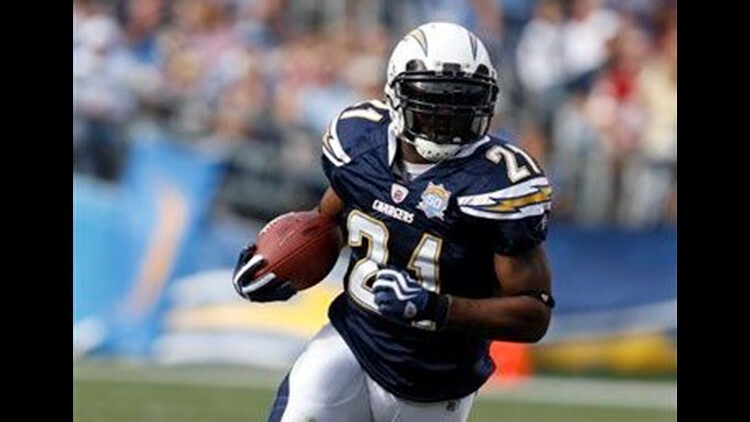 He was drafted with the fifth overall pick in 2001 out of TCU, and immediately became a star as he helped the Chargers become a perennial playoff contender. His 138 career touchdowns rushing rank second, and his 153 total touchdowns rank third. After a heavy workload and a few injuries made him less effective in recent seasons — last season was the first in which he rushed for fewer than 1,000 yards — Tomlinson's focus appears to be on winning a Super Bowl. That's something both the Vikings and Jets might be able to offer because both were a win away from making it to the NFL's big game last season.